Our meeting for May was a very exciting meeting because we had our birthday fabric exchange and potluck. It was a very good meeting because we had our "snow birds" back. Those are the ladies that go to Arizona and Texas for the Winter. 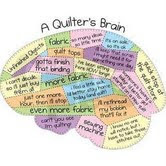 I look forward each month for our quilt guild meeting because we share so much and we all enjoy each other's company. It is always fun to see what everyone else has been working on for the month. The May meeting is when we bring a dish and eat good, delicious food. 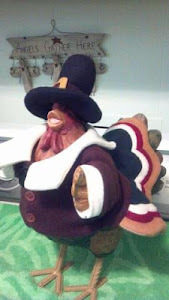 You see quilters are usually great cooks as well as creative. Anyway you can see by the pictures that we have a great time. we even had a birthday cake. I love the flower arrangement that our hostesses created. I brought a big piece home. Love birthday cake. And it was so good. Not only did we eat we of course had show-n-tell. And we had some very creative "show offs". Helen made this beautiful quilt for her daughter. This is the quilting on the back of the quilt. These are the faces of some very happy quilters. Jean found this quilt top at a yard sale for $1. She rescued it. They did know what a treasure it was. You shouldn't cover your face because I can't remember who this is. We all fell in love with Marian's quilt. And are anxious to learn the technique. Kay had about this quilt. I should have wrote it down. Sue made this cute kitty cat quilt. Mary entered this in the Paris art council exhibit and won 1st place. Mary made this quilt for her neighbor that is graduating this year. Kimmy made her daughter a purse out of a pair of camouflage pants. This is what they all are looking at. Kimmy's purse. Then the birthday fabric gifts were passed out. Yeah. Mine came in this. Pretty. As you can see we work all the time, Jean and Pat are sewing binding on Jean's quilt. Aren't these mini kimonos lovely, they are part of Mary's wall hanging I showed earlier. Mary says she loves doing origami. So these are the all the birthday fabric, everyone laid them out and I went around and took pictures. This is a special time for us. It is so nice to see what we bought each other. Each gift is so special. We put our name on a piece of paper along with what color fabric we want. Then we pull names. So from December to May we forgot what color we wanted, what a great surprise when we open the package and get exactly what we like. This was so much fun I learned something and that is what we go through as quilters to get the right fabric for $15 then we kind of hold our breath until each bag is opened and the fabric is revealed and the sighs of relief when that quilter opens her gift and her face lights up because they love what they received. The feeling is priceless. These are the fabrics I received. "This is my first jelly roll" That is what Marion said when she opened hers. Well that is all for now next meeting we will be working, working, working on quilts.